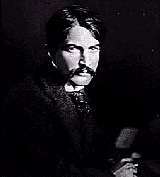 Stephen Crane was the first American writer to create fictitious novels and poems that were based in pessimistic realism. He is also noted for his graceful style and ability to understand and convey the psychological makeup of his characters. He often published under the pseudonym Johnston Smith. During his lifetime, he became acquainted with other writers such as Joseph Conrad and Henry James. He was the fourteenth child born to Reverend Jonathan Crane, a Methodist minister, and Mary Crane. Primarily, his father took positions in New York and New Jersey. Early on, he rebelled against his father's teachings. He attended Lafayette College from 1889 to 1890 and Syracuse University from 1890 to 1891. He excelled at athletics, particularly in boxing and baseball. He left university when his mother died and never finished his degree. In 1891, Crane became a freelance reporter in the slums of New York City. Although he didn't last long in this position, the experience provided the information for his first book, Maggie, A Girl Of The Streets. With the financial support of his brother, he published this book in 1893. While his first effort was unsuccessful, however, it provided the basis for future works. Most of his characters cannot change their fate, which is an often unfriendly and cold environment. His second novel The Red Badge of Courage received international success. The plot departs from traditional war stories of high-ranking officers and their heroism. Instead, the novel recounts the story of a lowly young recruit and his base human wartime experience. One of the most remarkable aspects of Crane's works is that his detailed and vivid descriptions of the war came from the facts he collected by interviewing soldiers. Crane, himself, never fought in the war. His narrative abilities, however, earned him a position reporting conflicts such as the Greco-Turkish War and the Spanish-American War. During an assignment in Cuba, he was shipwrecked, an experience that he portrays in The Open Boat and Other Stories, published in 1898. In the late 1890s, Crane published two volumes of poetry that show him to be an early adopter of free verse: Black Riders and Other Lines and War is Kind and Other Lines. About this time, he met and married Cora Taylor, although he is reputed to have had several affairs. Crane died of tuberculosis at the young age of twenty-nine. His body was buried in the family plot in Elizabeth, New Jersey.